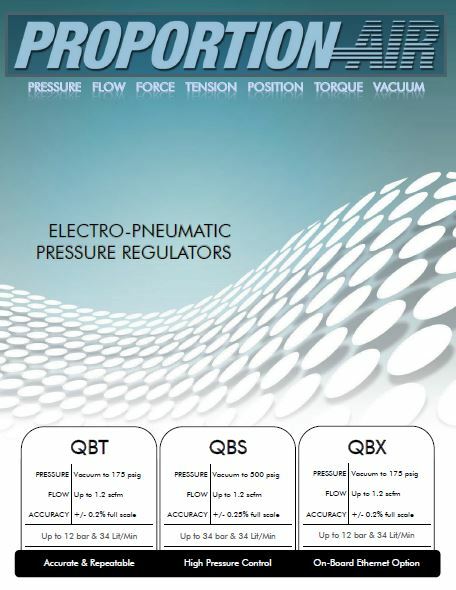 QB1S & QB2S electro-pneumatic closed-loop air pressure control valve are in a compact package in 1P65 housing. Analog monitor output is standard, select 0-10 VDC or 4-20 mA. The dual loop accepts feedback from signal from a wide range of external sensors. Either unit is unaffected by mounting position or vibrations to 25Gs. They operate with standard industrial air filtered to 40 microns while not consuming air in a steady state, reducing operating cost. These units can be assembled to an air pilot regulator (volume booster) for higher flows up to 3,000 SCFM, higher pressures to 7,000 psig and control of various gaseous and liquid media. An optional digital display is available. QB1X & QB2X electro-pneumatic closed loop pressure control valves are in a compact IP65 rated housing. Analog monitor output is standard, select 0-10 VDC or 4-20 mA. The dual loop accepts feedback from signal from a wide range of external sensors. It is available with either aluminum or 303 stainless steel manifold. Either unit is unaffected by mounting position or vibrations to 25Gs. They operate with standard industrial air filtered to 40 micron while not consuming air in a steady state, reducing operating cost. These units can be assembled to an air pilot regulator (volume booster) for higher flows up to 3,000 SCFM, higher pressures to 7,000 psig and control of various gaseous and liquid media. Optional digital display is available. MM1 & MM2 electro-pneumatic closed loop air pressure control valves are available with DIN rail, panel mount or up to 12 station sub-base manifold mounting. Analog monitor output is standard, select 0-10 VDC or 4-20 mA. Jumper selectable command 0-10 VDC or 4-20 mA. Common supply and exhaust ports on sub-base manifold for easy plumbing. Adjustable dead band allows field tuning of system stability. The dual loop design accepts feedback signal from a wide range of external sensors. 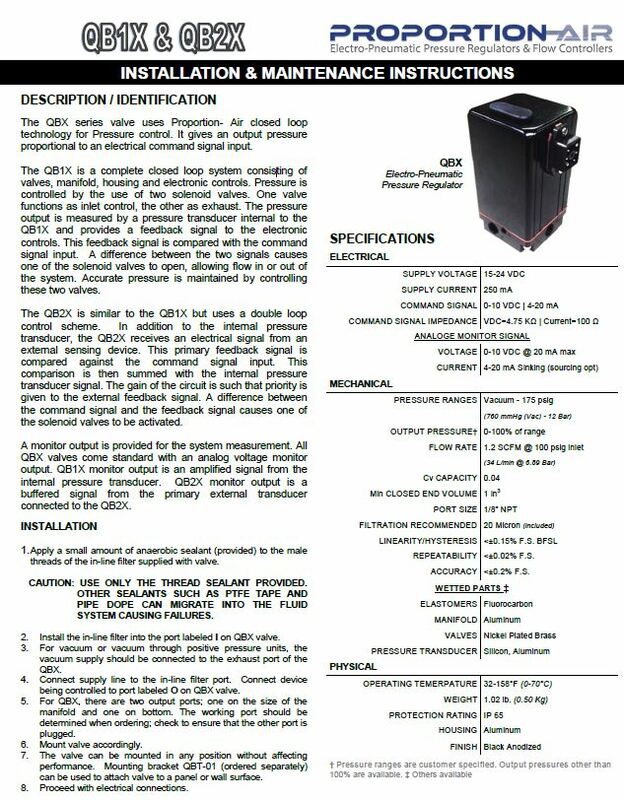 The QB3 is a complete electronic pressure regulator package consisting of two feed and bleed solenoid valves, a control circuit, a pressure transducer, an integral air pilot operated volume booster and a rugged IP65 housing. Analog monitor output is standard, select 0-10 VDC or 4-20 mA. Select 0-10 VDC or 4-20 mA differential command signal. Available options include a digital display, manifold mount, a variety of wetted elastomers and brass body version cleaned for oxygen service. QB3H electronic pressure regulator consists of two solenoid valves which add or subtract pressure to the pilot of an integral volume boosting regulator. An internal stainless steel pressure sensor measures the high-pressure output of the integral volume booster and send this signal to the onboard controller. Available in lightweight aluminum, stainless steel or oxygen service compatible brass bodies.